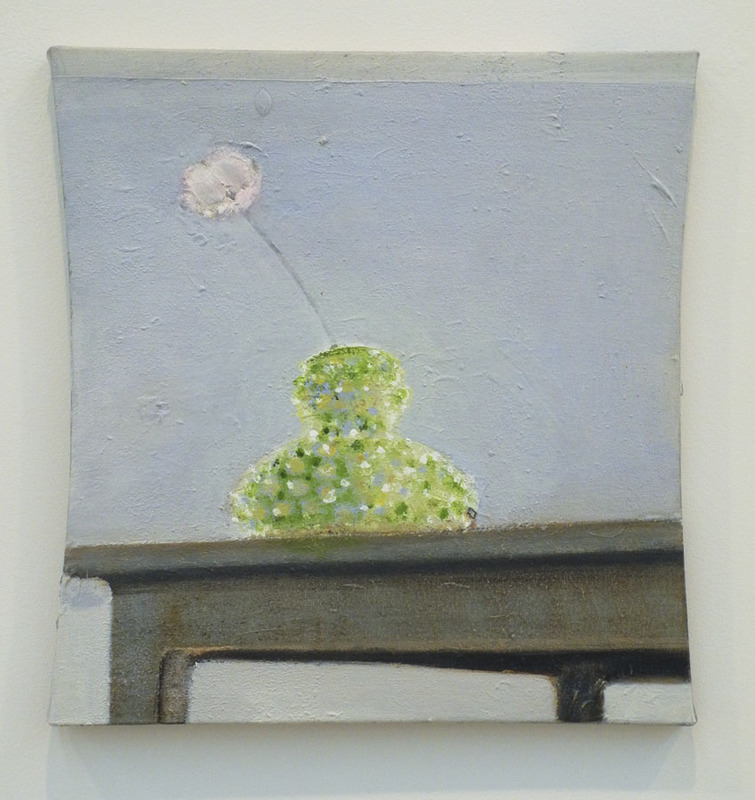 Single Flower, 2014; acrylic on canvas, 18.9 x 18.1 in. A painting of a pink flower in a bright green vase on a table: what could be more silly or clichéd? 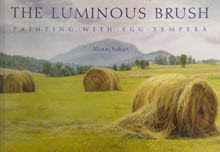 And yet, through Merlin James's brush, it becomes a touching image, a sign of the fleeting tenderness of beauty. The green-spotted vase is like a figure holding aloft a delicate gift. 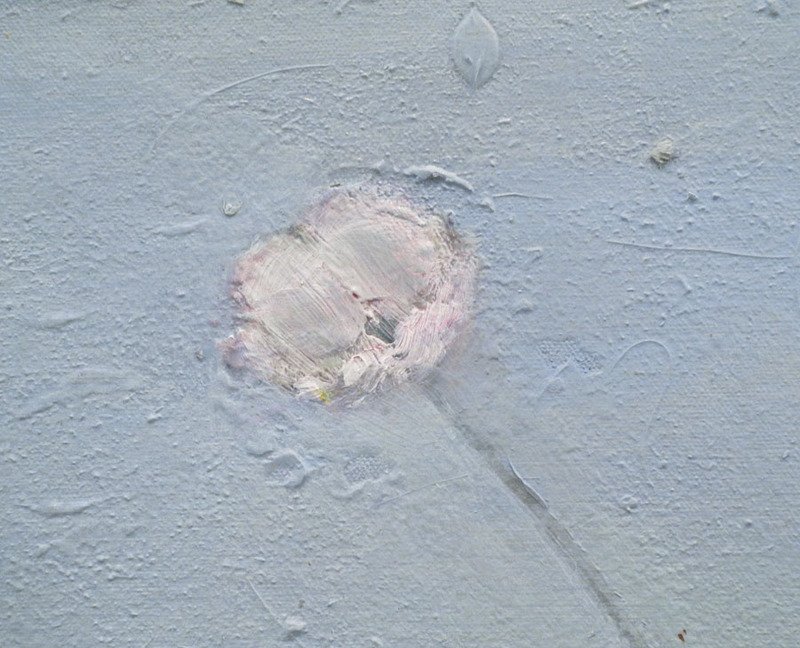 The painting's surface is built up of marks and drips and stuff stuck in the paint, giving a sense of the intense involvement of the artist's hand and eye, his joy in the surprising things that happen: a leaf-shaped drip, a stem sinking into paint, pink petals both light as air and physically solid. 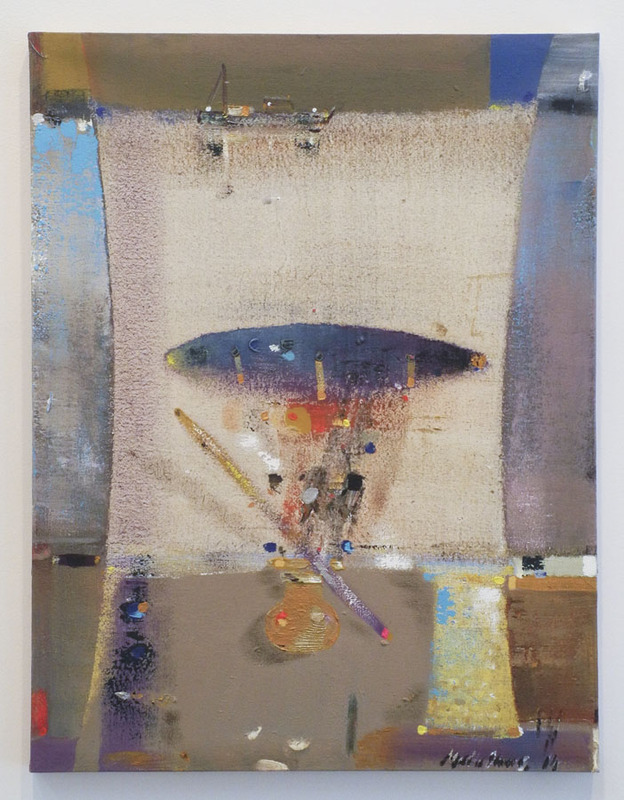 Still Life, 2014; acrylic on canvas, 23 x 30 in. Merlin James's show "Genre Painting" at Sikkema Jenkins was a wonderful surprise for me (there are excellent images at the link; the photos in this post are my own): I hadn't seen his work before, and when I looked at the show online it seemed to me to be too much of a grab bag of styles and ideas and subject matter and form; this made it look as though it were held together solely by an intellectual construct, a theoretical way of approaching painting, a high-handed cleverness. Oh, how wrong my assessment was! I have several times been disappointed by seeing work in person that I very much liked online, but I don't remember such a turnabout from skepticism to love when in front of actual work. 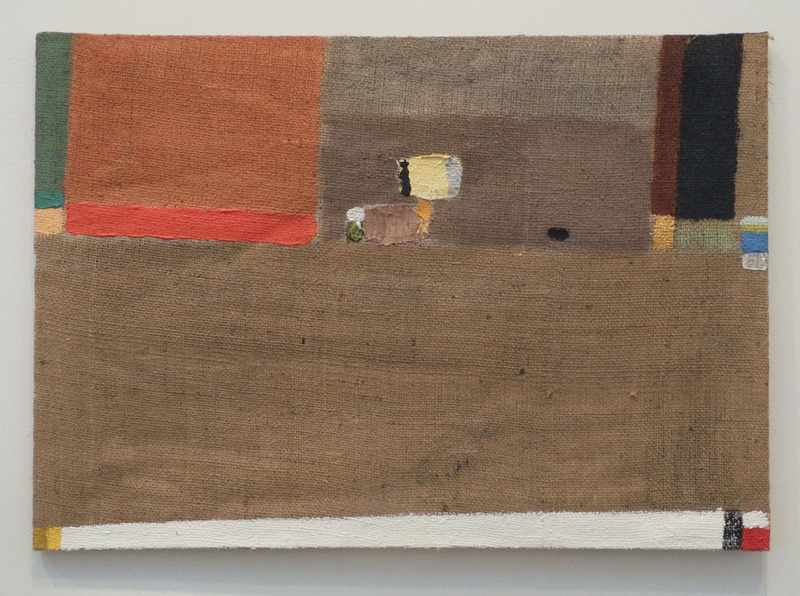 It is the quality of the paint––its searched-for texture and touch––and the artist's sensibility, that pulls it all together into a celebration of painting. Of the genres that James tackles, one is still life: the dark mood of Still Life is very different from the optimism of Single Flower. 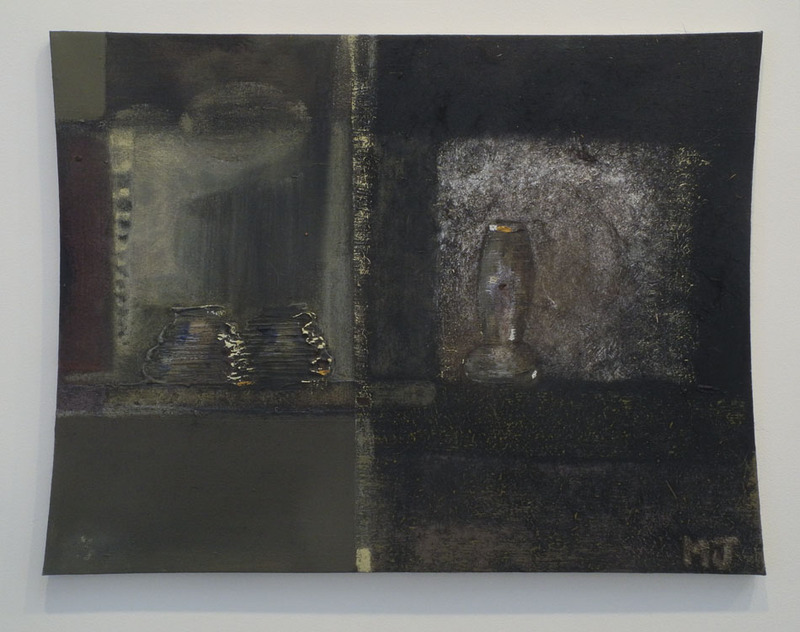 In both paintings there is a thing-ness to the objects depicted, a palpable presence in a built environment. 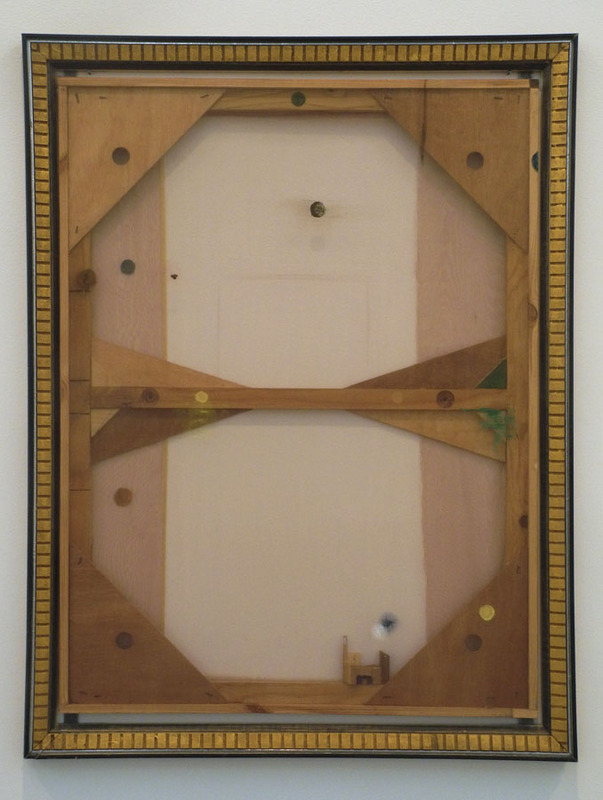 In both paintings, and in others in the show, the vertical sides are bowed inwards, as though yielding to the pressure of the external world. We tend to ignore the rectangle of most paintings; it's a neutral space. 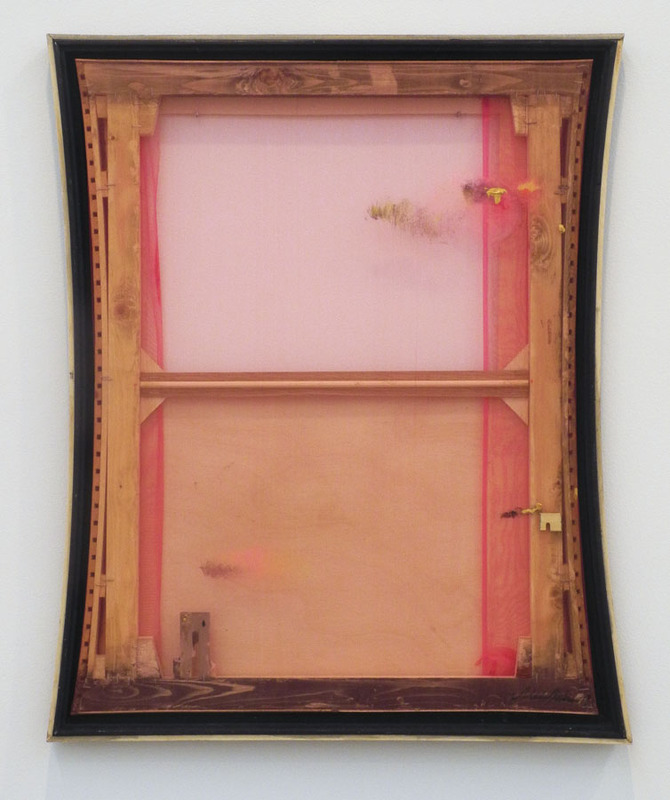 The bending of the rectangle adds energy to the picture plane; it asks us to notice the window. Moon, 2014; acrylic on canvas, 22 x 19.5 in. Another genre: landscape. A silvery moon, reflected in some clouds, hangs above a sweep of greenish land. 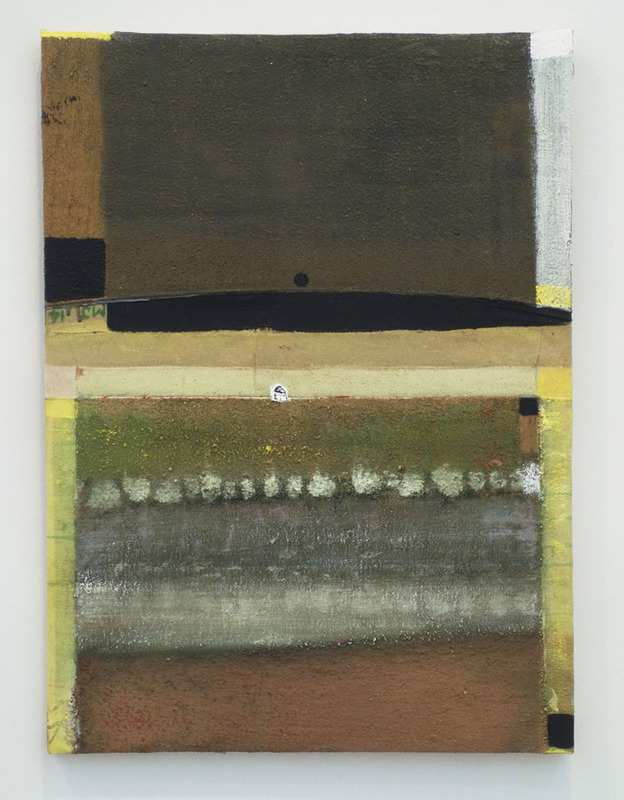 The simplicity of the image is punctuated by a line of green and dabs of paint at the bottom. 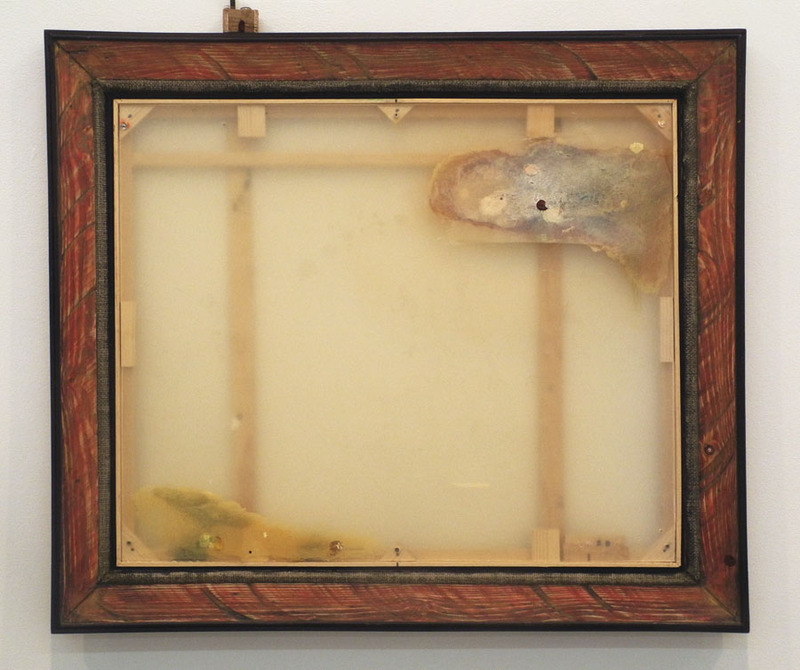 This added gesture both removes the painting from ordinariness, and interjects the artist's personality. 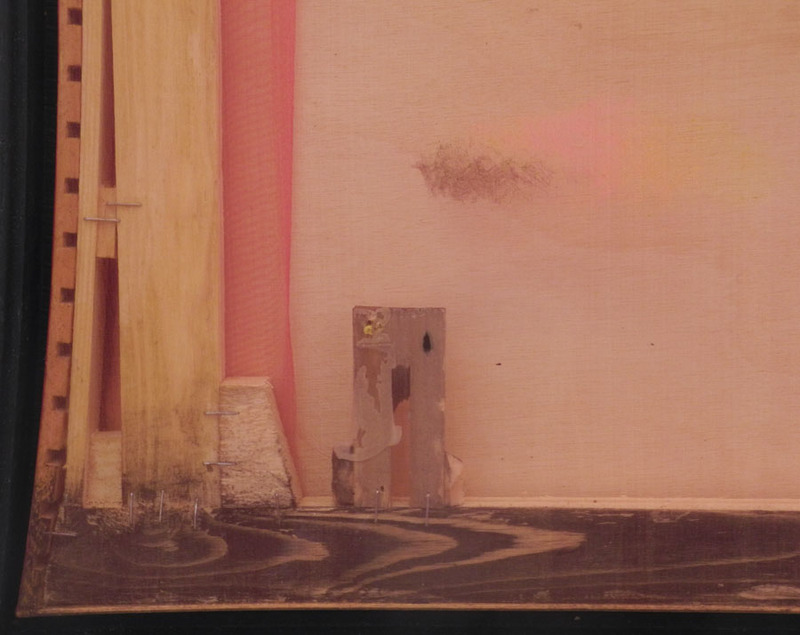 It allows a closer look at the transparent layers of paint above, the little dots of imperfection. 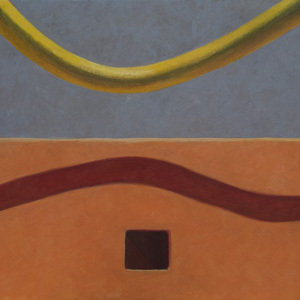 By Marshes, 2004-14; acrylic on canvas, 33 x 23 in. 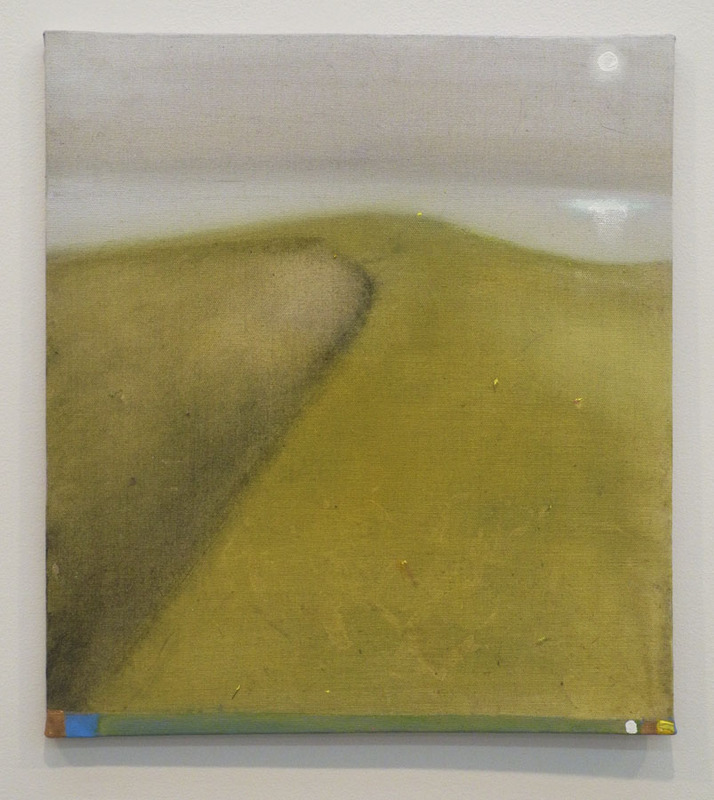 Another painting approach that James takes is that of the abstracted landscape: an image, appearing non-objective, yet based on something seen, as we are informed by the title. This painting has a luscious surface, but not in the sense of juicy; it's actually very dry, looking like sand or cement, but holding lots of color. Abstraction, 2002/2015; acrylic on canvas, 19 x 27.5 in. On to pure abstraction, shapes and colors without reference to objects in the world. In this oddly balanced painting, every element feels perfect, even the rough dark canvas used as a ground. 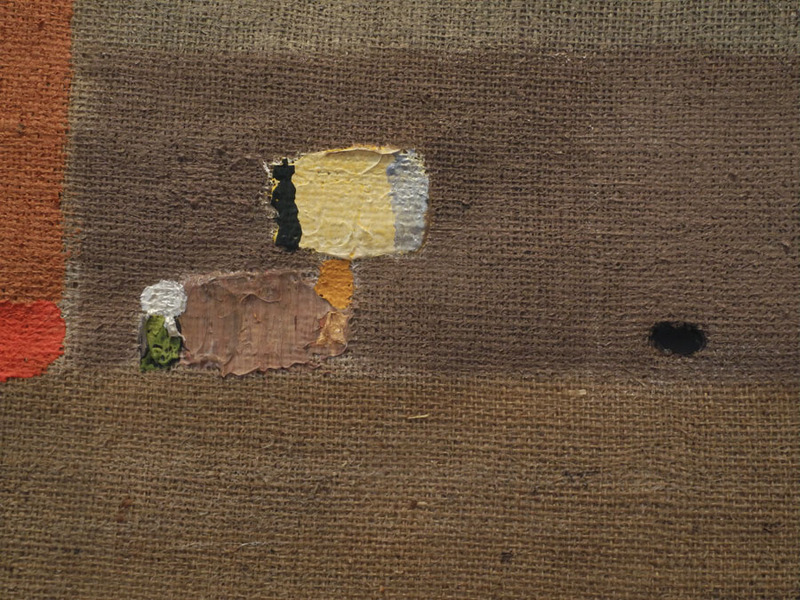 The painting support is very irregular, and I wonder if it's just a burlap sack. The touches of color on it are so carefully placed, so richly brushed, that they transform the disheveled surface into a thing of beauty. 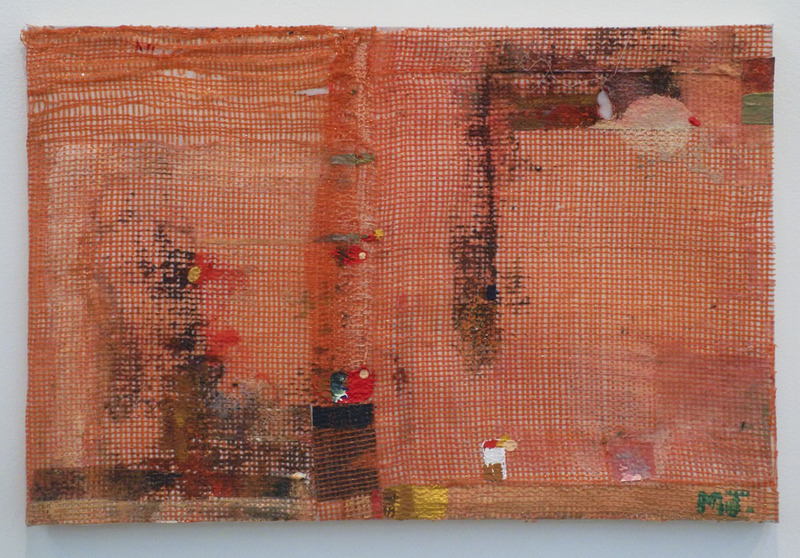 Red, 2013-14; acrylic on canvas, 17.5 x 26.5 in. All the works in the show are labeled as being on canvas, I believe to assertively identify them as paintings and not as constructions or anything else. Whatever the support, traditional or not, opaque or transparent, the paint on it has great sensitivity and thoughtfulness. There is also tremendous charm in a work such as Red. The brilliantly colored support, with shiny threads, looks like nothing more than a sack that holds oranges or other produce. How magical to transform this bit of detritus into a painting both serious and playful; I honestly can't say how James does it. Capriccio, 2014; acrylic on canvas, 41 x 31 in. ....there are small bits of paint here and there, circles repeating the cut circles in the four corners. A special surprise is the tiny "cityscape" tucked away in a corner. Old Kiln, 2012-15; acrylic on canvas, 28.5 x 33.5 in. In Old Kiln, pools of color flow across an acrylic surface. 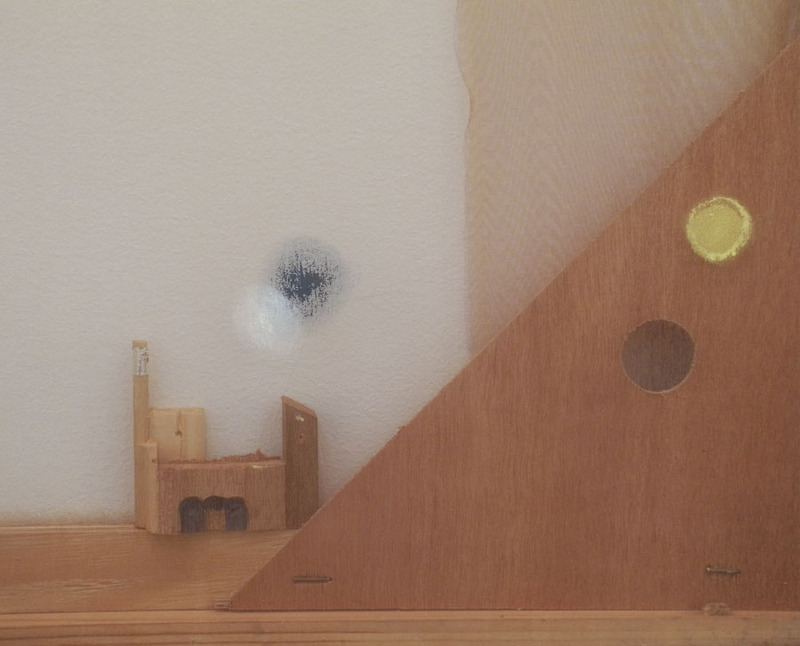 Here too a small construction shifts scale: pieces of wood closer to and farther from the surface create a visual depth; their geometry plays with the organic movement of paint; their softening with distance becomes fading memories, just out of reach. Sunset, 2014; acrylic on canvas, 26.6 x 22 in. Sunset's "window" is strongly curved, making an elegant surround for the pink glow of the "canvas". There's something almost Renaissance-architectural about it for me. Marine Painting, 2014-15; acrylic on canvas, 28 x 21 in. 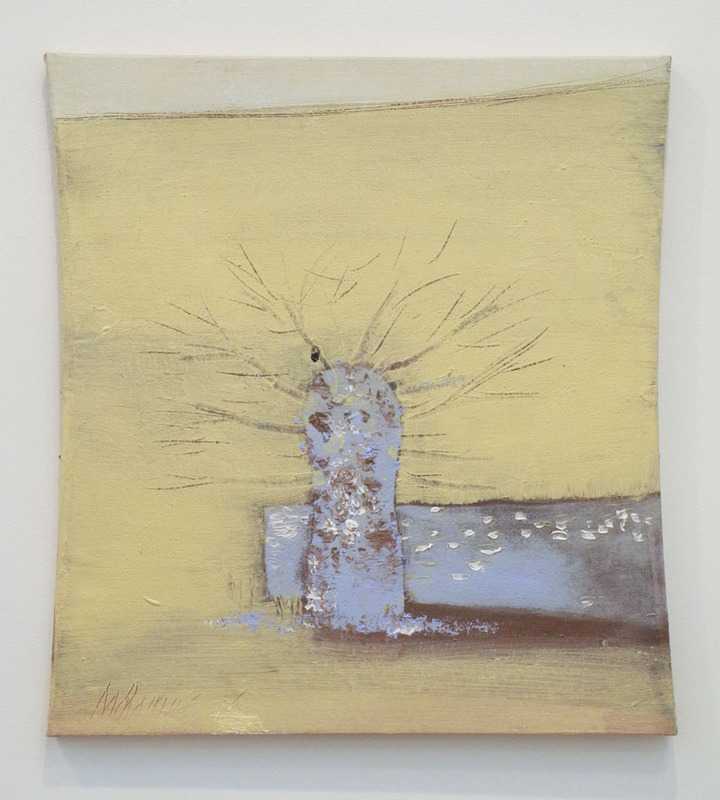 Tree and Wall, 2014; acrylic on canvas, 24.375 x 22.375 in. 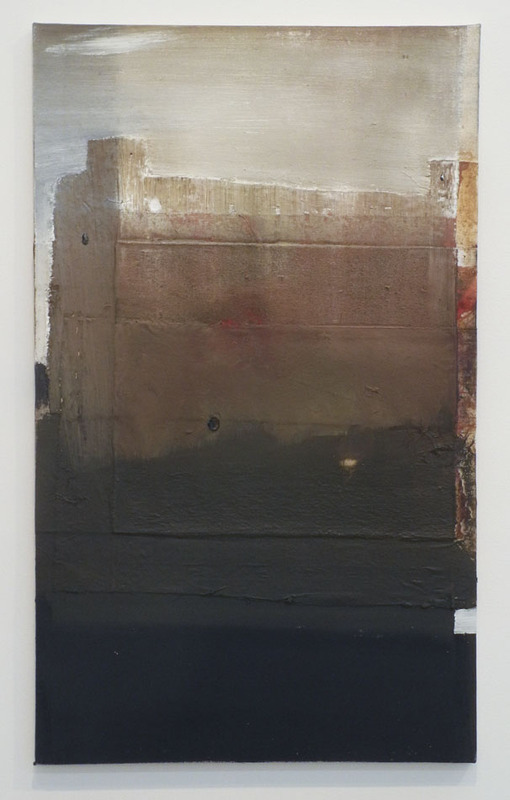 Old Fortified Buildings, 2010-14; acrylic on canvas, 40 x 24 in. 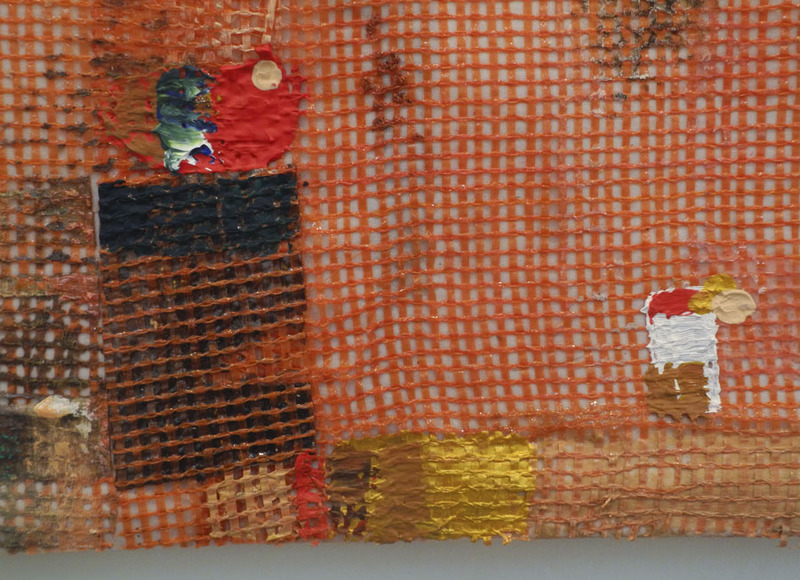 ....or richly painted on layered materials in an abstracted landscape. Merlin James uses paint with reverence and with delight and love. What an interesting body of work. You are a paragon of how to stay open and curious about work, something I so admire. Thank you for this post, I really was compelled by the work and your words. Thank you so much, Deborah, for reading and for your generous comment. What is so good about the internet and blogs like this, is that we can see what another sees and read what another thinks. It is a joy to see Mr James' and Mr Zurier's work (in addition to Ms Sultan's work). Thank you. I'm so glad you're enjoying these posts, James. A New Textile: "Arcs and Squares"
A New Boxed Paintings: "Blues"
A New Painting: "Rectangular Blues"